Let the Old World inspire a new you as Princess takes you to Europe's classic destinations as well as its less travelled gems. 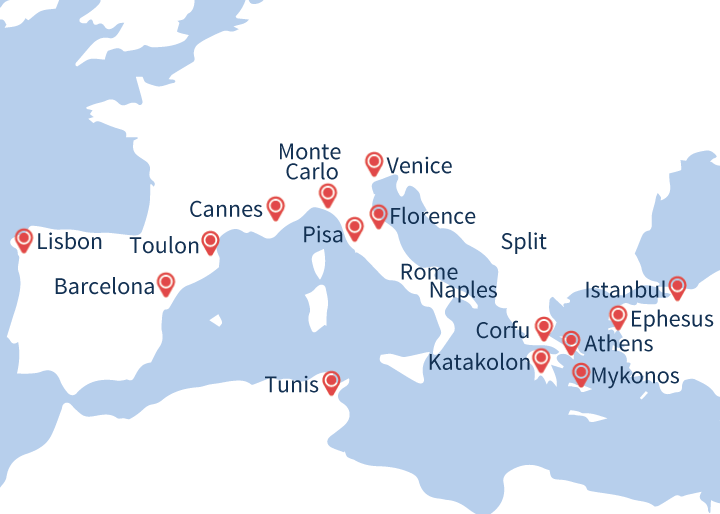 From the storied Mediterranean to the far reaches of Northern Europe, we have an array of options that let you create the ultimate bucket list adventure. It's no wonder we've been named "Best Cruise Itineraries" for nine consecutive years. The magic of Europe comes aboard as well, where you'll dine on authentic cuisine – one of many reasons we've been awarded "Best Cruise for Food Lovers" by Food & Wine Magazine – and enjoy regional entertainment and presentations that bring the legends and lore to life. 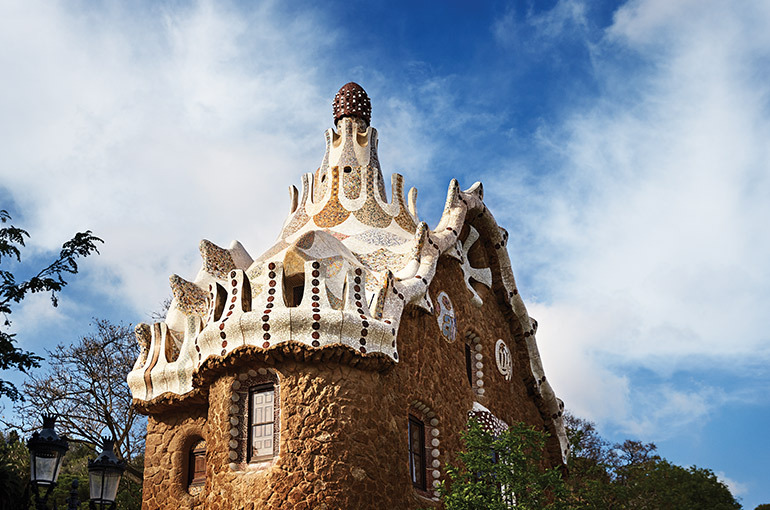 The Catalonian capital of Barcelona provides a vivid mix of ancient and modern but is probably best know for the bizarre Art Nouveau architecture of Antonio Gaudi, in particular the iconic Sagrada Familia, Europe’s most extraordinary – and still unfinished – cathedral. Boosted by hosting the Olympic Games in 1992, Barcelona’s Old Port area has been transformed into a thriving area of cafés and restaurants. From there, it is an easy stroll up the famous Rambla to the old town. Las Ramblas is thronged with street entertainers, stalls and bars and is most lively at night and weekends. Not to be missed is the La Boqueria food market with its extraordinary displays of fish, meat, fruit and vegetables. That classic holiday combination of endless sun, sea and sand make Corfu one of the most popular, as well as one of the largest Greek islands, but it has a lot more to offer. Head inland, through heavily-scented pine woods, and you will find tiny villages like Sokraki where only Greek is spoken and time appears to have stood still. And the capital, Corfu Town, is Greece's largest ‘living’ medieval town home to cobblestone streets and alleyways, historic buildings, statues and fountains. The stand-out is the Venetian-built Old Fortress, now a UNESCO World Heritage site. The largest and arguably the most beautiful of the 12 islands forming the Dodecanese, Rhodes has long played a major role in history. Lying just 12 miles off the coast of Turkey, the island straddles the sea-lanes linking Egypt, Southern Europe and the Holy Land. Rhodes Town bears witness to that long history. The ancient city features a classical stadium and the ruins of the Temple of Apollo. The "old" city is a walled town with medieval buildings and streets harking back to the days of the Crusades. The new town is a Mecca of luxury resorts lining the island's picturesque Mandaraki Harbor. The Colossus of Rhodes, one of the Seven Wonders of the Ancient World, is reputed to have once stood guard over the harbor. Today, the bronze statues of a stag and doe top the two columns marking the harbor entrance. The proud city of Heraklion is the modern capital of Crete, largest and most ruggedly beautiful of the Greek Isles. Just along the coast, you’ll find the scrupulously renovated remains of Knossos, the Palace of King Minos and the island’s capital under the Minoans. Here, the endless maze of salons, staircases and courtyards gave rise to the legend of the Labyrinth, housing the evil Minotaur at its heart. See the legend come vividly to life! One of the most visited Greek islands; Mykonos is a jewel in the Aegean Sea, famed as a vibrant and cosmopolitan destination. 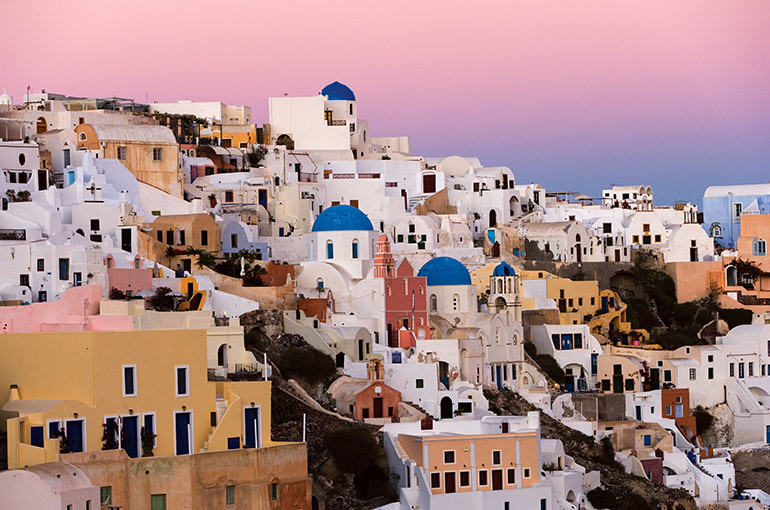 It is one of the most visited islands in the Aegean, yet still retains much of its picture postcard beauty. Mykonos effortlessly strikes a balance for visitors with a mix of lively bars and restaurants in the most populous areas, with nearby areas of tranquillity, outstanding natural beauty and rich history. The Town of Mykonos is a hive of activity with some of the most famous landmarks such as Little Venice, famous for its picturesque medieval two and three storey houses which stand like a colourful wall against the sea. Mykonos is also world famous for its beaches. Kalafati Beach is a prime example with golden white sand lapped gently by a crystal clear sea. Better known as Frances main naval base than as a cruise port, Toulon has unexpected charm and is all the better for not being a major tourist destination as you can wander through the cobbled streets of its delightful old town untroubled by crowds. Look out for the superb maritime and art museums, the magnificent Romanesque cathedral and Le Marche, where fresh flowers, fruit and vegetables are bought to market every day. Ship buffs also have the bonus of watching the comings and goings of the French warships around the harbour. The best view of the old town and the harbour is from Mont Faron which overlooks both - take the funicular up from Boulevard LAmiral Vence. There are some excellent beaches a short drive along the coast or head for the beautiful and often dramatic Provencal countryside or to the French Riviera resorts. Monte Carlo is famous for the four ‘G’s’: the Grimaldi monarchy as well as its Grand Prix, Glamour and Gambling. The famous Grand Casino is only one of several but, if you are feeling lucky, note that it operates a strict dress code and requires all players to show passports. The first thing you notice when you arrive is how pristine the mega-yachts look in the harbour. This only fuels the suspicion that their owners - rather than risk going to sea - actually prefer to tie-up permanently at one of the worlds most fashionable addresses. Napoleon was born here and, if you did not know that before, it would only take a few minutes after cruising into Ajaccio to cotton on as ‘Boneys’ name and likeness is everywhere. The main shopping street is called Cours Napoleon and the wide tree-lined boulevards, parks and large squares in this newer part of town feature many statues of the great man, notably in the main square (ironically called General de Gaulle). The Old Town between the port and the imposing citadel on the cliff above boasts Napoleons House and the cathedral where he was baptised. The main marketplace is right by the port and here you'll find lots of local craft goods and endless Napoleonic souvenirs. Nestling in the Bay of Ajaccio, halfway down the islands west coast, Ajaccio is an excellent base from which to explore Corsica and discover why it is called the ‘Scented Isle’ (because of the sweet aromas from the mountainside maquis vegetation). Magical Istanbul - 3,000 years old, spanning two continents and a crucible of cultures where east meets west - is a key Turkish homeport for cruise ships, and even those ‘just visiting’ usually spend a night as this wonderful city offers so much to see and do. If this is your first visit, a tour of the main sights is a good introduction to the city’s treasures, which include the world-famous Blue Mosque and the equally impressive mosque of Suleyman the Magnificent, the vibrant old city, the Grand Bazaar (a warren of narrow streets containing more than 4,000 shops, stalls, restaurants and artisans’ workshops) and the Topkapi Palace, famed for its jewels but which also has spectacular gardens. Also worth seeing is the ancient Hippodrome - now an open-air museum. And a boat trip across the Bosphorus to view the minarets and grand palaces of the city’s skyline is an unforgettable experience. Kusadasi is a bustling successful port that provides excellent access to the extraordinary remains at Ephesus. If you're not on a tour try hiring one of the huge gas-guzzling American cars (left by former servicemen) and turned into cabs by the enterprising locals. In Ephesus, enter the magnificent site of the Ancient City at the Magnesia Gate. Whilst Ephesus is now deserted and in ruins, the past glories come to life as the impressive array of temples, agoras, porticoes and fountains come into view. Of particular interest are the Odeum, the Celsus Library, the temple of Hadrian, the Fountain of Trajan and the Great Theatre. Built over a 2nd century tomb believed to hold St. John the Evangelist, St. Johns Basilica was once topped with eleven domes and rivalled Istanbuls St. Sophia Basilica in scale. The church is now in ruins, but there are many frescoes, mosaics and columns that attest to the glory that once marked this holy place. Sailing into the beautiful 12th century Croatian walled city of Dubrovnik is one of the great cruising experiences. The spectacular Old Town – with its pretty harbour, towering ramparts, creamy stone pavements and red-roofed buildings – is crammed with architectural wonders like Onofrio’s Fountain - constructed in the 1430s – and the 14th century Franciscan Monastery, home to a wonderful statue of the Piéta carved in 1498, and the world’s oldest pharmacy (est. 1391). Visit the magnificently Gothic Sponza Palace and the 18th century Baroque Church of St Blaise, Dubrovnik’s patron saint. La Goulette, the cruise port for Tunis, lies about 40 minutes shuttle bus drive away from the city, but is much closer to the ruins of Carthage. The 2nd century Colosseum and Roman Temple are only 20 minutes drive from the port, and most excursions combine Carthage with a restful stop at the pretty seaside village of Sidi Bou Said. There are more archaeological treasures to be found in Tunis itself; the Musée du Bardo houses a huge collection of Byzantine and Roman mosaics, while you can see sections of the old Roman aqueduct running through the city centre. But the focal point for most visitors to the city is its bustling medina – the old walled town, with its graceful, tree-lined squares and lively souk. A browse around the carpet and jewellery stalls is a fascinating experience, as you can watch weavers, perfumiers and goldsmiths practice their ancient arts. Founded in the 16th century by the Grand Dukes of Tuscany - the Medici Family, Livorno remains a busy port and town. Its centre, which is walkable from the port, has some pretty bars, cafés and chic shops but most of Livornos cruise visitors head straight for Pisa, Florence, or the Tuscan towns of Lucca and Siena. You may be surprised to find that the recently restored Leaning Tower is just one of many towers in Pisa and that elegant Florence is compact enough to be walkable. With the Arno river running through it, you should be able to keep your bearings fairly easily as you visit the Uffizi Gallery and cross the gold and silver merchants-lined Ponte Vecchio on your way round the many attractions of this startlingly beautiful Renaissance city. This World Heritage city is just about the perfect cruise call because everything you want to see is so easily accessible whether the ship docks just down from St Marks Square or further up the Grand Canal at the main Venice cruise terminal complex. Cars are banned from the maze of narrow cobbled streets and 500 historic bridges within the city centre so there are just the two choices for getting around: the vaporetto (water-bus) network or just plain walking. A gondola ride is really for fun and romance rather than transportation. Standing in the Colosseum, visiting Vatican City and tossing a coin in the Trevi Fountain are all unique experiences of a lifetime to be had in the Eternal City of Rome, reached from your Italian cruise port Civitavecchia. Rome’s breathtaking monuments, palaces, churches and classical features are quite unlike anything you will find in any other European city. They will always leave you wanting to come back for more – hence the coin-tossing, which is said to guarantee your return. The city’s other must-sees include the Spanish Steps, the Pantheon (probably the most complete ancient Roman building in the city) and the Sistine Chapel, home to Michelangelo’s masterpieces.